Because Illinois taxes can get pretty complex, the Taxpayers' Federation of Illinois, Illinois Fiscal Policy Council and Tax Foundation created "Illinois Illustrated," a book that makes the state's taxes easier to understand through direct, user-friendly graphs and charts. From local to corporate taxes, the visual guide provides Illinoisans with a comprehensive overview of state taxes and the economy in general, sans all the confusing tax terminology. The selected charts and graphs below are from the report; a full version can be found here. 5. 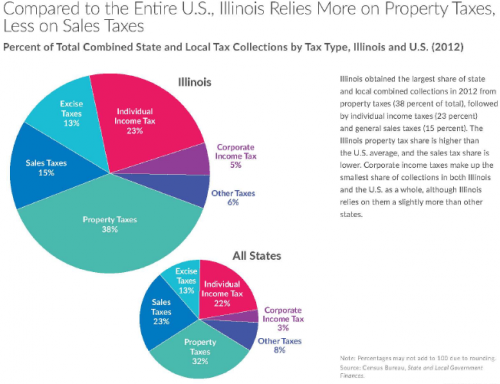 When compared to the rest of the U.S., Illinois is much more reliant on property taxes, which accounted for 38 percent of all the state and local taxes collected in 2012. The sales tax share in Illinois--15 percent--is eight percentage points lower than the combined average of each state. 4. One of the most important components of a state's tax policy is revenue stability over the business cycle, according to the report. When the state economy experiences variations, certain types of taxes tend to respond differently to these changes. 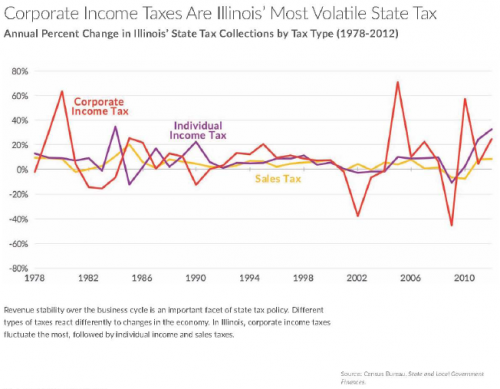 In Illinois, corporate income taxes were found to fluctuate the most. 3. 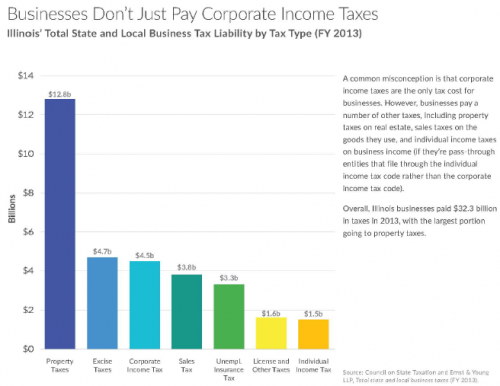 On top of corporate income taxes, businesses in Illinois are subjected to an array of other taxes. In fact, of the $32.3 billion paid by the state's businesses in 2013, the largest portion--$12.8 billion--came from property taxes, with corporate income taxes constituting the third-largest source of tax revenue. To see two more facts you should know about Illinois taxes, including how the sales tax has become less and less a part of the economy, check out Reboot Illinois. Want to tell your elected officials what you think of the state of government in Illinois? Use our Sound Off tool!